Submitted by Quest-News-Serv... on Sat, 09/12/2015 - 15:50. A California company called Alternative Ballistics has developed an easy-to-install accessory for hand guns that promises to make bullets non-lethal allowing law enforcement to incapacitate a suspect without causing life-threatening injuries. The most important feature of the accessory, called The Alternative, is that it doesn’t interfere with the operation of a handgun in any way once it’s clipped onto the muzzle. The weapon’s sights still work, and other accessories like flashlights can still be attached. So how do you make a speeding bullet less lethal? That’s easy, you simply reduce its speed. The Alternative holds a hollow metal sphere on the end of a gun’s barrel that’s designed to catch a bullet as it leaves the weapon and hitch a ride, in a manner of speaking. The metal sphere, made from a proprietary metal alloy, will reduce the speed of a bullet by up to 80 percent while spreading out the point of impact on a target. So when it makes impact there’s less chance of it piercing flesh and causing serious internal injuries. Still, it hits the target with enough force to knock a person down, just like a non-lethal bean-bag round would, but with far more accuracy. 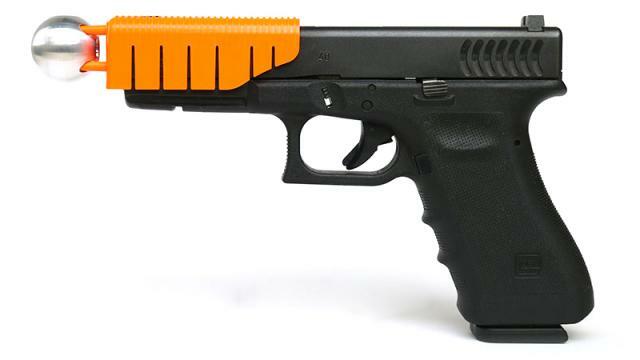 Designed as a single-use accessory, The Alternative’s orange plastic support is automatically ejected from a handgun after a shot has been fired, allowing law enforcement to immediately continue firing with regular rounds as needed. Because it’s so easy to install, teaching officers to use the accessory can be incorporated into regular firearms training with minimal additional time or cost. And because it can be carried on their person at all times, it’s a non-lethal alternative that’s always within quick reach so there’s a better chance it will be used more frequently.